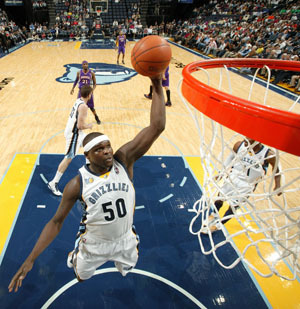 What makes Zach Randolph such a tough cover for other power forwards and how does he get his points? Because Zach Randolph is a very thick and strong player, he makes it very hard for defenders to keep him off the spots he likes to get to. Randolph draws fouls, gets to the free throw line, and works very hard at grabbing offensive rebounds. So all of these factors combined make it very difficult to stop him. Ever since he first arrived in the league, Randolph has been one of those guys who’s known as a scorer. He’s got that certain something special that only a portion of players are gifted with. Whether he scores in an isolation situation or off an offensive rebound, Randolph finds a way to knock down shots. He scores a lot of points with his back to the basket, and he’s got a very soft turnaround jump shot. According to all the reports I’ve heard, Zach Randolph has been a very positive influence on his young Memphis team and is working hard to try and help them make the playoffs. what make a small forward like rudy gay a tough match for other small forwards how does he score?